The Delphic Oracle belonged to Apollo, and his priestess, called The Pythia, gave her oracles from inside Apollo’s temple. The word, “oracle,” comes from the Latin word oraculum, which means both a prophecy made by a god (or priest) and the place where the prophecy is given. Similarly, the English word, “oracle,” has both meanings. So, the Delphic Oracle refers to the place where the prophecies were given, but an “oracle” can also refer to the prophecy that Apollo gives there. The Oracle at Delphi seems to have originally been held by Gaia (Aeschylus, Eumenides 1-8). According to some accounts, Gaia had a snake or dragon, named the Python, that guarded her oracle. When Apollo came to take over the oracle, he first had to kill the dragon in order to take possession of it. Apollo’s priestess got her title, The Pythia, from the Python. Delphi was (and still is) located in central Greece, on the side of Mount Parnassus. The temple of Apollo, where the prophesies were given, was (and still is) situated in an incredibly beautiful spot about half way up the mountain. This is one of the most beautiful places on earth, and the Greeks clearly chose this spot for the temple with good reason. There were many other oracles in Greece, but the Oracle at Delphi was the most famous, and everyone who could afford to consult the Oracle at Delphi preferred to do so. Of course, there was a long waiting period to consult the oracle (sometimes several months), and there were a number of expensive, preliminary sacrifices. 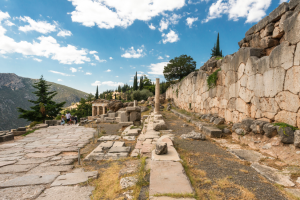 Most of the people who consulted the Oracle at Delphi were wealthy individuals or even heads of state. The long path leading up the mountain to Apollo’s temple, called the Sacred Way, was lined with treasure houses. 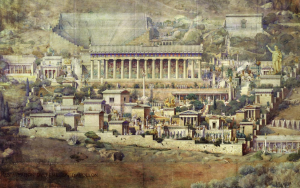 These treasuries were filled with costly gifts that leaders and cities had given to Apollo. Some of these treasuries are still standing, and a very few of those precious gifts can still be seen in the museum at Delphi. When someone came to ask a question of the Oracle, he would need to make a preliminary sacrifice of a goat, and then purify himself in the nearby Castilian Spring. 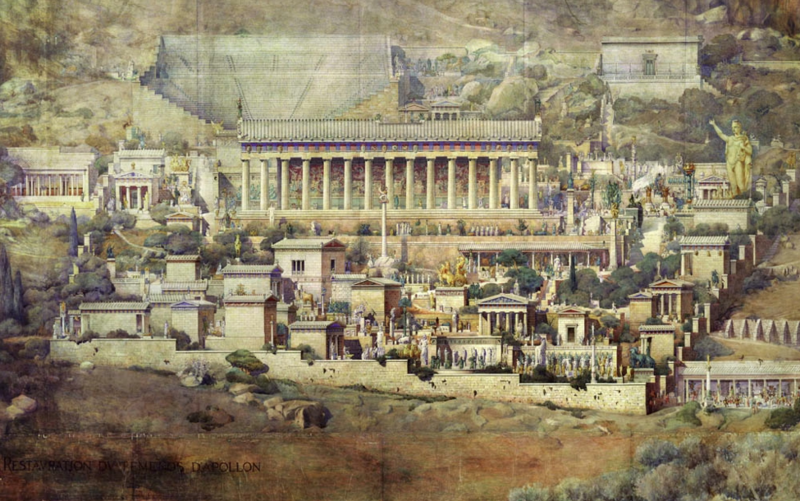 Then he would approach the adyton of Apollo’s temple. The adyton is a room inside the temple that was off limits; no one could go in. It is unclear whether those who were consulting the oracle were allowed to go inside the adyton, or whether they had to remain outside. 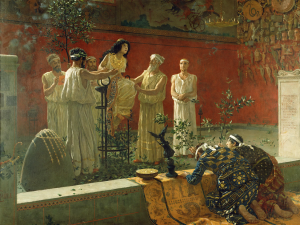 The Pythia is usually conceived of as sitting on a tripod when she gave her prophecies. A tripod (as its name implies) was a three-footed stand, usually made of metal. Tripods had a round, metal band around the top, and they were usually used to hold a cauldron over the fire for cooking. But in this case, the Pythia would sit on it, almost like she was sitting on a three-legged stool, to give her prophecies. After the person consulting the Oracle asked his question, the Pythia would go into a trance; it was believed that Apollo himself possessed her. 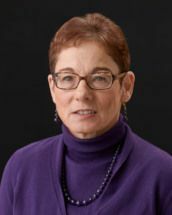 She would speak and a priest (or several priests) who were standing near-by would take down what she said and translate her words into a poem written in hexameters. It is usually assumed that the Pythia’s original words were coherent, but not very clear. Of course, there is no way to know for sure what her words were really like, but perhaps we can get a good idea from Cassandra’s prophecies in Aeschylus’ play, the Agamemnon. In that play, Cassandra gives several prophecies that make sense to the audience (because we know what is going to happen), but are so fragmented and confusing that the other characters in the drama do not understand them. Once the Pythia’s words were translated into hexameter poetry, the poem was written down and given to the person who sought the advice; it was always the responsibility of the recipient to interpret the oracle correctly. And the oracles, even in their final form, were always ambiguous. Frequently (though not always), the recipients did not interpret them correctly, and they suffered as a result. 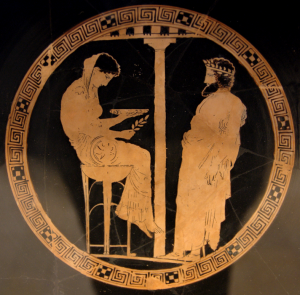 According to Herodotus, Croesus, the king of Lydia, asked the oracle if he should go to war with Persia. Lydia was a large and very prosperous kingdom in what is now central Turkey, but Cyrus, the king of Persia, had recently expanded his kingdom so that it bumped up against Lydia’s borders. Croesus felt threatened by the Persian expansion, so he wanted to know if he should attack Persia before Persia attacked him. The Pythia answered: “If you go to war against Persia, you will destroy a great empire” (Herodotus 1.53). Croesus interpreted this to mean that he would destroy Persia, and so he gathered his forces and attacked. But Croesus lost the war, and in the end, he was forced to admit that he had destroyed his own, great empire (Herodotus 1.91). There are many examples of people misinterpreting oracles (usually because, like Croesus, they interpret it according to what they want to hear), but there are a few examples of people who interpret their oracles correctly, and benefit greatly as a result. This coin was minted depicting Antiochus Hierax of the Seleucid Empire from the mint in Sardis. The reverse side depicts Apollo sitting on the omphalos. 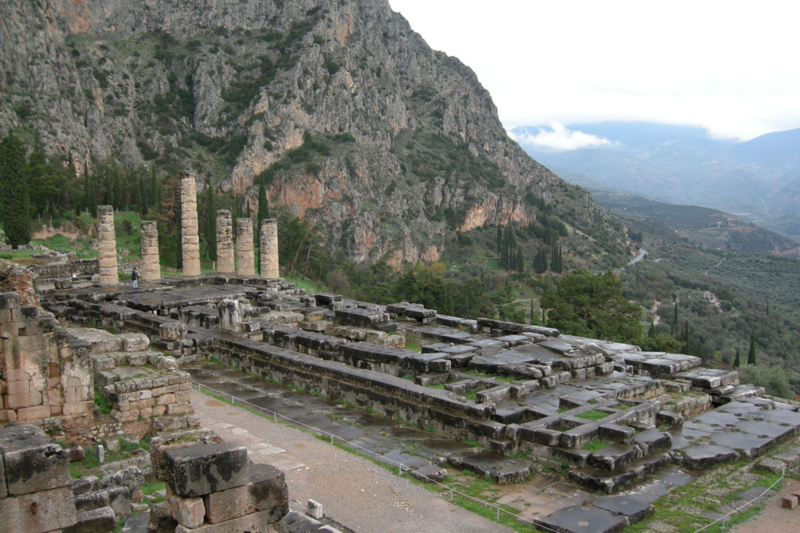 The Greeks believed that Delphi was located at the center of the earth. Near Apollo’s temple was a rock (about 2-3 feet high) shaped similarly to a bee-hive, and carved with a floral pattern. 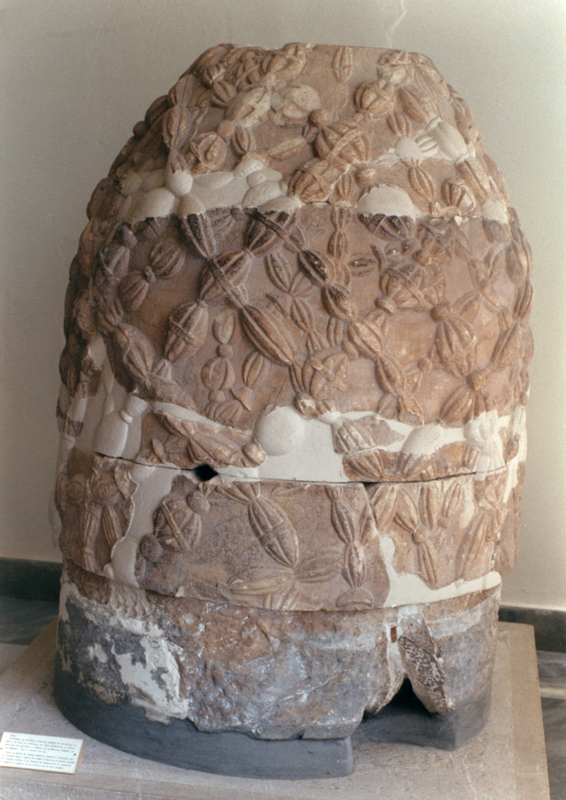 This was the omphalos (or “navel” in Greek), which was considered to be the navel stone of the earth. In art, Apollo is sometimes shown using this as his seat, implying that his oracle was in some sense the epicenter of everything that occurred on earth. According to Hesiod (Theogony 497-500), this was originally the stone that Rhea had given to Cronus to swallow instead of Zeus. Zeus placed it at Delphi after Cronus had vomited it up (with the other Olympians) and Zeus had won the battle with Titan to gain control over the cosmos. Originally published by REBUS Community Pressbooks, in Mythology Unbound: An Online Textbook for Classical Mythology, under the terms of a Creative Commons Attribution-NonCommercial-ShareAlike 4.0 International license. This entry was posted in Ancient, Greece, Greek, History, Mythology. Bookmark the permalink.